What comes next: 40, 43, 37, 49, 25, ? Correct! The answer is 73. Sorry! The correct answer is 73. Sequence follows this rule: +3, -6, +12, -24, +48. Passing your pre-employment assessment is just the tip of the iceberg - you need to practice and prepare for your aptitude tests. Not sure which tests you need? Try Finding the right tests. Try some of our Free Tests and see what’s in store for you. If you need any help or tips, check out our Blog page. WHAT: The All Aptitude Tests Package offers an optimal preparation for the full range of different tests that employers normally use during their application process. WHY: These tests help to give the employing organization a better evaluation of the candidate’s suitability for the job that they’re applying for. HOW: It contains all the Numerical, Verbal, Logical and Simulation Tests you need to pass your assessment. WHAT: The Predictive Index Learning Indicator (PI LI) is a 12-minute test comprised of 50 questions. WHY: The purpose of the PI LI assessment is to measure your cognitive ability or your capacity to learn and adapt in the workplace. HOW: The most important thing about the PI LI test is not the difficulty - it’s time. You have 14.4 seconds per question, so the essence to passing it is practice. WHAT: A Raven’s Progressive Matrices Test is a test designed to measure your non-verbal, abstract and cognitive functioning. WHY: Measures spatial, abstract and cognitive reasoning ability, as well as problem-solving skills. 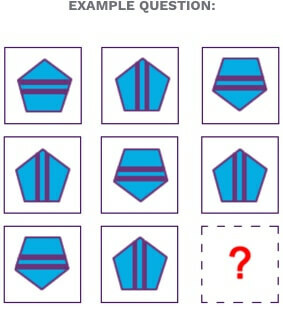 HOW: A candidate is presented with a matrix of 3x3 geometric designs, with one piece missing. The candidates' job is to choose the right diagram, that completes a pattern in the matrix that you have to figure out. Preparation for CEB/Gartner (SHL), Cubiks, Kenexa, Saville, and more! Assesses your ability to reason with concepts and mathematical relationships. 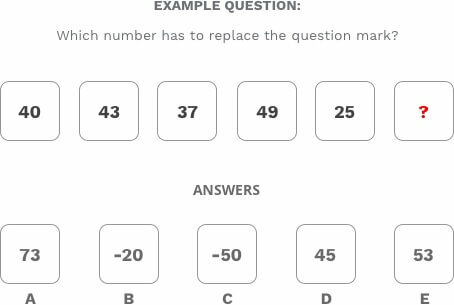 This test requires you to find the missing number in a sequence. Try now! 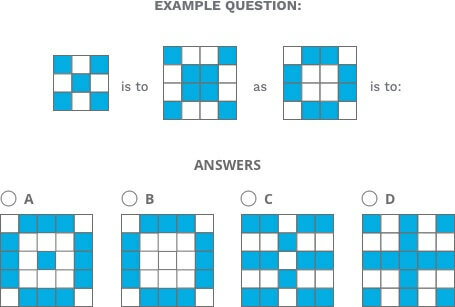 This test measures your problem-solving ability. You have to think logically and methodically to spot the patterns in a sequence of graphics. Try now! Assesses your understanding of tables of statistical and numerical data, as well as your ability to make logical deductions. Prepare to succeed. Try now! This test assesses your capability to understand, analyze and interpret written information. It comes down to reading comprehension. Prepare to succeed. Try now!